The massacre that took place back in 2009 at the Fort Hood Army base in Texas has dramatically changed the lives of many people. Not only the families of the 13 victims who died that day but the survivors of the shooting as well. Victim Shawn Manning still has bullets in his body and gets very uncomfortable in crowds. Kathy Platoni is haunted by images of the man who died at her knees in a pool of blood. Alonzo Lunsford has problems getting out of chairs and warns family members to wake him gently. Those are the struggles they face every day. 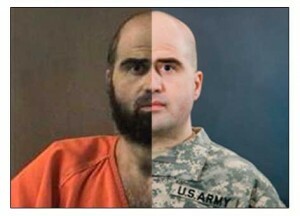 Now four years after the shooting they will face another demon, Maj. Nidal Malik Hasan, the Army psychiatrist who was charged in the shooting, goes on trial Tuesday. Hasan, is a Muslim who argues that he was protecting the Taliban from American aggression. The trial will be even more difficult for the survivors as Hasan has dismissed his attorneys and been given permission to represent himself. This will give him an unusual opportunity to question the very people he targeted. Now retired Staff Sergeant Alonzo Lunsford, who was shot seven times by Hasan, looks forward to the day when he can look him in his eyes and tell him that he did not win. Lunsford still has a bullet in his back and one that he keeps in a small wooden box. Platoni just wants to hold herself together for the sake of the family of Capt. John Gaffaney, her friend and fellow soldier who died right next to her. This trial is going to take an emotional toll on all parties involved, from the survivors who have to face him again to the families of the fallen soldiers who were killed by Hasan, who are facing him for the first time. Eduardo Caraveo, son of Libardo Eduardo Caraveo who was killed, took some time off as a prison supervisor so he could get ready for the trial mentally. “You’re going to hear stuff, that you don’t know how you’re going to take,” he said. “I want to be the one in control here, not him,” said Joleen Cahill, wife of Mike Cahill who was shot six times while trying to fight off Hasan with a chair. She struggles with the loneliness of an empty house, now she has to struggle to not take her anger out on the killer of her husband at his trial. Shawn Manning recalls what happened that day in a large hall where troops were preparing for their deployments and were all unarmed. All except one person. Hasan. “I hear someone yell ‘allahu akbar’. Usually something bad is going to follow after that, so I look up at him and he started shooting. He probably fired five or six shots before he shot me in the chest,” said Manning. Manning was a newlywed of only a few weeks at the time of the shooting and was almost done with his duties for the day. Platoni had already left the hall and was in a nearby building. Caraveo was also in the hall seated in a row of chairs. Then without warning everyone’s life changed in a heartbeat. “The memories are there all the time when I’m not otherwise actively engaged in patients or doing gardening. It’s something that haunts me constantly,” said Platoni. The shooting only lasted 10 minutes, but the aftermath will last forever. Lunsford and Manning were hospitalized for weeks and have both retired from the military. They are still fighting to receive wages they were denied when officials ruled that the shooting was not a terrorist act and that their wounds were not received in combat. Manning will have to undergo surgery to remove a bullet from his thigh and possibly one from his back. Only a month after the shooting Platoni was back serving her country on a deployment to Afghanistan despite the trauma she had just lived through. She is still a clinical psychiatrist in her private life in Ohio, as well as for the military. Some are hoping that Hasan will be getting the death penalty. “Realistically, Hasan may never be put to death, but that may not be a total disappointment. Living in a cell, paralyzed for the rest of his life is some sort of justice as well,” said Manning. Our hearts go out to everyone who was affected by this cowardly act of terror and we can only hope that our lack of government will be brought to justice, by being forced to compensate the soldiers as they should be compensated.